With an increasing range of complexity and low-cost initiatives, today’s networks and applications can quickly turn into a tension headache for IT staff like Poor Edna pictured here. Saving money while meeting more demand for better user experience drives the hybrid enterprise effort. The cost-saving infrastructure in a hybrid enterprise includes networks, storage, and servers that can be fully or partially implemented somewhere in a private or public cloud with virtual and traditional computing that is software defined. Just as one example of these changing conditions, VMware’s NSX platform provides what can be considered as a “hypervisor” for all the routing, firewall, and switching environments as software running on a virtual platform—no more telneting to physical routers with CLI commands! For more information, see this brief. The same thing goes for the apps that run on a mix of the cloud. Most of us are now very familiar with our “as-a-service” acroynymns—SaaS, PaaS, and IaaS. Commonly adopted hybrid enterprise apps include Office 365, Salesforce, Workday, and more . . . along with infrastructure, storage, and other services paid for on monthly subscriptions from cloud providers such as Amazon Web Services (AWS) or Microsoft Azure. For hybrid enterprises, the promise of savings mount from a less expensive physical footprint as well as more flexibility to get data and apps where they need to be and quicker—especially when you have the right application performance platform in place. If not, you’ll be chasing blind spots in your application delivery chain that come from only using point solutions from the past—that is, one tool for each segment from a vendor that specializes in one thing and no integration with the overall complete picture. 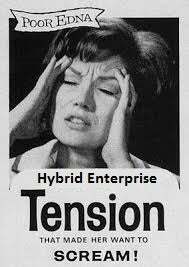 Here are three ways to provide the right remedy for any complications that can come along and result in a hybrid enterprise tension headache. Don’t get stuck with a tension headache like poor Edna! For visibility across the hybrid enterprise, it’s critical to get the right metrics to the right individuals who can address the issue at those day-end situation rooms where you’re all debating over whether it’s the network or the app and now “the cloud.” You’ll want to get cloud visibility, branch visibility, and end-to-end visibility. As many are now saying, “You cannot manage what you don’t measure—or see.” The right data helps you validate and measure everything that is important to your app delivery process and be proactive to issues that might affect your business bottom line. In some cases, you might need to do a deep dive with a packet capture at one of the branch offices in your network or consult an instrumented server in your data center. Apps hosted in the cloud can be measured for their page views and the response times of the page views to hold your service providers accountable to their SLAs. When you have data that needs to get to users from anywhere on any device, you’ll want to deliver LAN-like performance for applications and data transfers regardless of WAN latency, capacity, and quality constraints. Using a WAN optimization strategy across your hybrid enterprise, you can accelerate applications by up to 100x. With the right application performance platform in place, you can use all of your solutions in concert with each other. For example, Riverbed SteelHead appliances can also serve as data feeds for your visibility tools for a complete, integrated solution where visibility from strategic locations across the hybrid enterprise becomes quite easy to achieve because you already have a valuable footprint in the location of interest. Once you have the right visibility and tools to improve end user experience, you’ll want to control and tune your environment when certain conditions or users need priority. For example, you might have a combination of MPLS lines and Internet links where your critical data traverses for mission-critical applications. With this in mind, you can identify some applications that you want to have priority over others for specific locations or sets of users. Having the tools to control who or what gets priority can really give you the flexibility to provide optimum service at a reduced cost. Much of the control is enabled by automatically identifying and organizing over a 1,000 applications running across your hybrid enterprise. Whether it’s video, voice, mission-critical, file transfer, or recreational traffic, you have the control to determine to policy configuration, reporting, and troubleshooting. Bringing this all together in easy-to-view dashboards makes this approach to the hybrid enterprise less of a headache and allows you to get back to the business of making sure that all of your end users are happy and productive.